Have you wondered why some sixty-year-olds look and feel like forty-year-olds and why some forty-year-olds look and feel like sixty-year-olds? While many factors contribute to aging and illness, Dr. Elizabeth Blackburn discovered a biological indicator called telomerase, the enzyme that replenishes telomeres, which protect our genetic heritage. Dr. Blackburn and Dr. Elissa Epel's research shows that the length and health of one's telomeres are a biological underpinning of the long-hypothesized mind-body connection. They and other scientists have found that changes we can make to our daily habits can protect our telomeres and increase our health spans (the number of years we remain healthy, active, and disease-free). 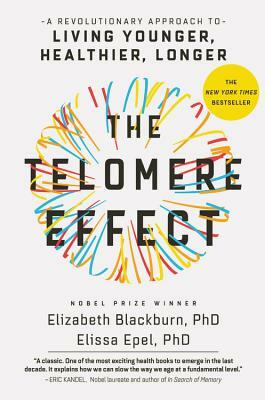 THE TELOMERE EFFECT reveals how Blackburn and Epel's findings, together with research from colleagues around the world, cumulatively show that sleep quality, exercise, aspects of diet, and even certain chemicals profoundly affect our telomeres, and that chronic stress, negative thoughts, strained relationships, and even the wrong neighborhoods can eat away at them. Elizabeth Blackburn, PhD, received the Nobel Prize in Physiology or Medicine in 2009 alongside two colleagues for their discovery of telomerase and telomeres' role in the aging process. She is currently president of the Salk Institute. Blackburn was elected president of the American Association for Cancer Research and is a recipient of the Albert Lasker Basic Medical Research Award, among many other awards. In 2007, she was named one of TIME magazine's 100 most influential people. Elissa Epel, PhD, is a leading health psychologist who studies stress, aging, and obesity. She is the director of UCSF's Aging, Metabolism, and Emotion Center and is associate director of the Center for Health and Community. She is a member of the National Academy of Medicine and serves on scientific advisory committees for the National Institutes of Health, and the Mind and Life Institute. She has received awards from Stanford University, the Society of Behavioral Medicine, and the American Psychological Association.